LITECOIN & Cryptos Looking For ConsolidatoinsteemCreated with Sketch. Several of the big names have had a great last few days (i.e. Litecoin, Bitcoin Cash). We should now be seeing some consolidation as we enter the start of the week. This is ideal. One of the things I wanted to show in this chart was a bigger view of the RSI on the daily. One of the things I've pushed before is noticing higher and higher price levels with a lowering RSI level. We're seeing this play out over the last month of trading days. Symbolically, this means the bulls are probably due for a little break here. 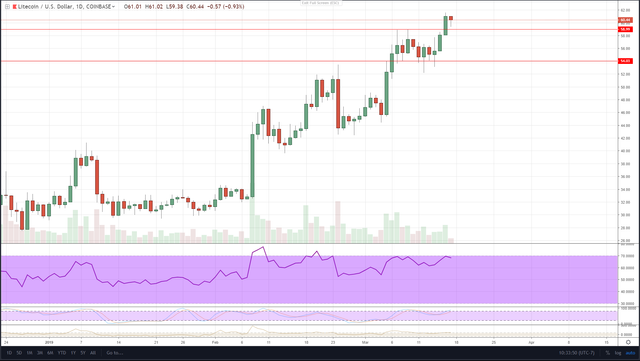 Most of the other cryptos don't have as great of a chart setup as Litecoin does, so it will be a lot more of a negative since there's not a higher high before consolidating more or pulling back. We still have strong resistance at the $59 level, so there's lots of hope for consolidation. Volumes are shrinking as well, so that makes consolidation all the more likely.